It’s no secret that I love chocolate. I’m trying to eat less of it these days (although you’d never guess that by all the chocolate posts I’ve been sharing) but we’re all allowed a special treat for Valentine’s Day, right? I’m not sure if Friday the 13th counts as a holiday too…but if it means I can start eating chocolate early, then it’s a holiday in my calendar! Do you ever sit at home daydreaming about food when all of a sudden you think of a delicious new recipe that you must try right now? Please say it isn’t just me. 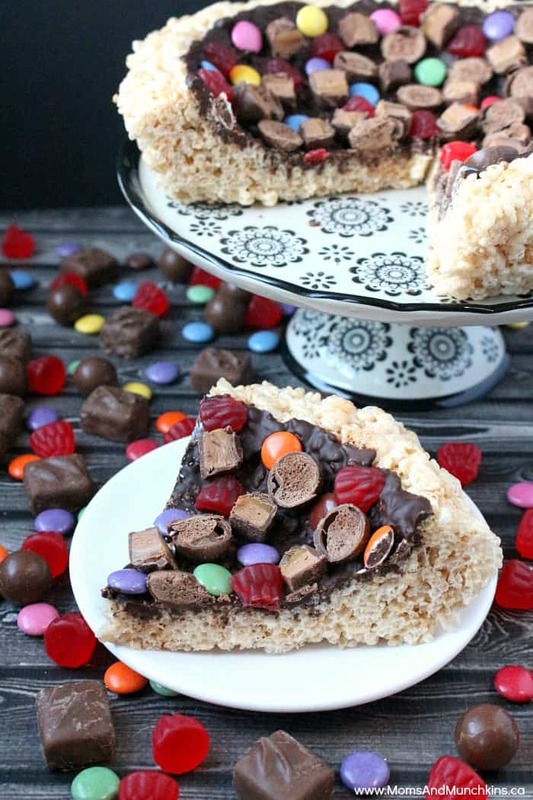 This afternoon I was thinking of Rice Krispies squares and candy and I thought a tasty treat would be to combine them both in a Rice Krispies Dessert Pizza. This is one of those recipes that leaves everything up to your imagination. Love chocolate? Then the “sauce” on your pizza could be melted chocolate chips. Not a big fan of chocolate? Top it with icing and set your candies on top. For my pizza, I used a melted chocolate chip base and topped it with candy coated chocolates, mini caramel chocolate bars and red gummy berries. Be creative – maybe even cut the pizza into slices first and set out all the toppings so your family can each create a personalized slice. Top with chocolate, candy, icing or any of your favorite sweet treats. Add the marshmallows and stir to evenly coat the marshmallows in melted butter. Put back in microwave for 1 minute. Remove from microwave and stir immediately. Add cereal and stir well until it is all coated. Spray a 9-inch pie plate with non-stick cooking spray. Spray generously so the cake doesn't stick to the dish. Put the Rice Krispies mixture in the dish and then wet your hands with cold water before pushing down on the mixture to form it into a pizza shape with a crust. The cold water keeps the mixture from sticking to your hands. Place in refrigerator for a couple of hours to chill before filling with your favorite candies. 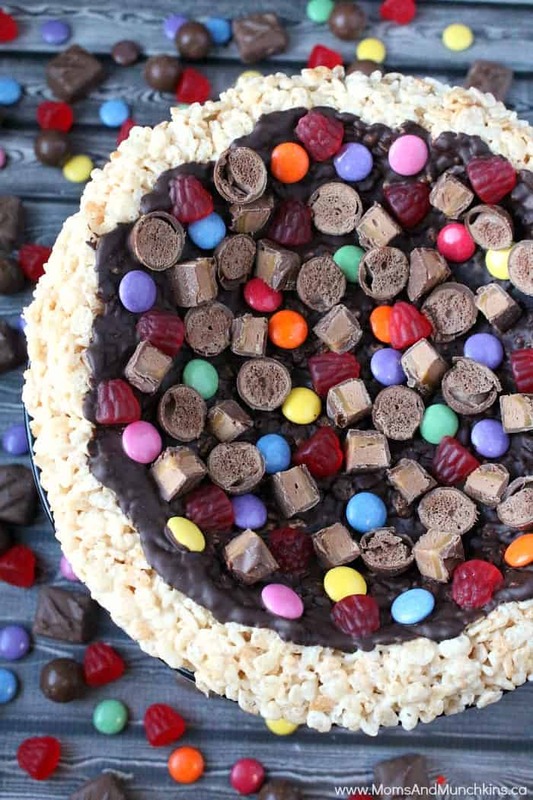 What would you fill your Rice Krispies Dessert Pizza with? 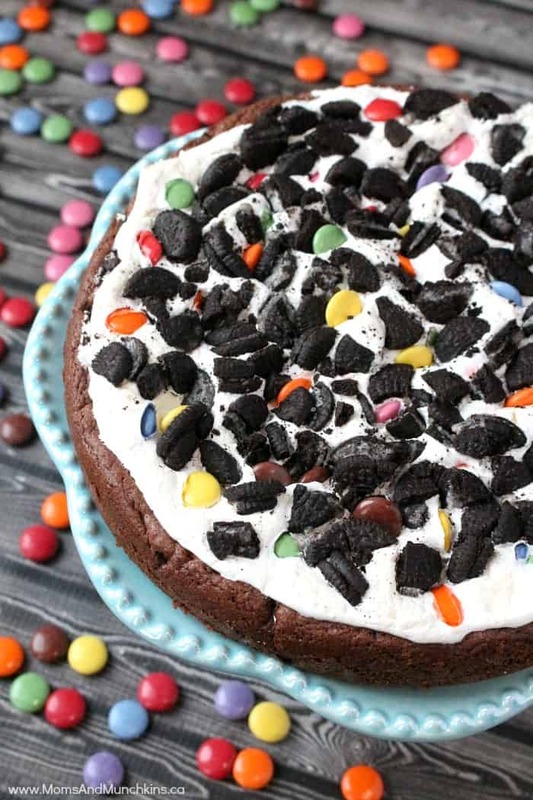 For another delicious dessert pizza idea, check out this Marshmallow Cookie Cake! We’re always adding delicious ideas for desserts, party appetizers and more. Visit our Recipes page for even more tasty ideas. Never miss a update by following us on Facebook, Twitter, Pinterest, and Instagram.